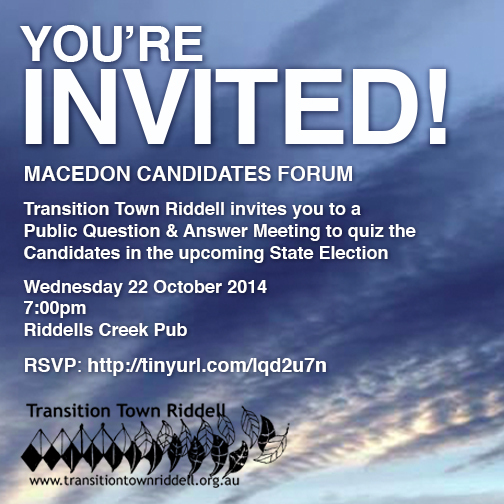 Renewable energy is a mainstream issue in the hotly contested seat of Macedon. Yes 2 Renewables have been supporting local community members who support renewable energy. So far in 2014, we’ve presented at the Woodend Sustainable Living Festival, published an open letter to the Macedon candidates, and hosted a film night. We have also held a demonstration near Woodend on the anniversary of the Coalition’s anti-wind farm laws and participated in the People’s Climate March in Kyneton. What also matters in Macedon is environmental sustainability. In recent months, renewable energy has become a unique battleground, where wind farm restrictions imposed by the Coalition have literally split the electorate. On one side of the seat a wind farm is operating at Leonard’s Hill, 10 kilometres south of Daylesford; on the other side, the planning laws have thwarted a community push to establish another wind farm in a pine forest on the outskirts of Woodend. The plan would involve creating three wind turbines, which proponents say could supply power to about 3300 houses and create hundreds of construction jobs. Friends of the Earth spokesman Leigh Ewbank, whose group recently surveyed 1500 voters across the electorate on this issue, says there is a “strong appetite” to repeal the Coalition’s bans – a move that Labor and the Greens support. 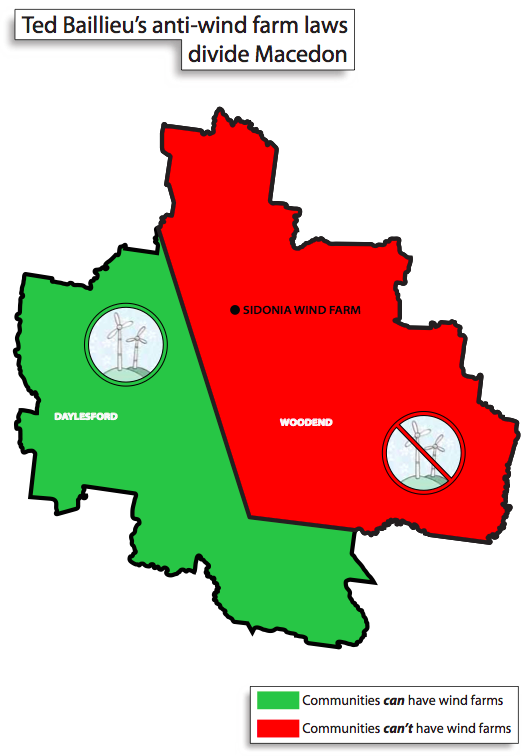 Commitments to scrap the government’s “no-go” zones for wind energy from the Labor opposition and The Greens would allow the Macedon Ranges Sustainability Group build their proposed community wind farm. It would allow other communities in the Macedon Ranges to pursue their own community energy projects. “A reversion to the ALP policy would mean no planning controls, no two-kilometre buffer, no right of objection – and that is undemocratic. If you look at the way the community reacted here for a proposal for a single-story conference facility in the east paddock of Hanging Rock, I do not think the community would tolerate large-scale wind turbines in this place,” she says. While Ms Petrovich is entitled to her own views on the desirability of wind energy, we’re pleased to hear her commitment to democracy. Friends of the Earth have partnered with the Macedon Ranges and Riddells Creek Sustainability Groups to undertake the region’s largest community-run survey. The initiative canvasses the views Macedon Ranges residents hold on energy options, including the current prohibitions on wind farms. The results of the community survey will be released before polling day. The community survey will allow Macedon candidates to adopt policy positions that are in line with the views of their constituents. With Ms Petrovich’s public commitment to democracy, we trust she’ll be keenly interested in the survey results and be open to modifying her position on the issues. 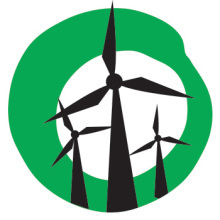 Typical line from Leigh Ewbank “whose group recently surveyed 1500 voters across the electorate on this issue, says there is a “strong appetite” to repeal the Coalition’s bans – a move that Labor and the Greens support.” They never survey the people that will actually be impacted by wind turbines. The 2km ban must remain to protect residents from inappropriately placed turbines! 3500km around Italy by bicycle last year past fields of wind turbines and solar cells with no health impacts and no noise. Sad that the lucky country is falling so far behind the rest of the world with respect to renewables and community-owned energy. The Italians are committed to renewables: it’s time Australia was too.